V&S Absolut Spirits has had a number of clever and interesting advertising campaigns for its Absolut brand of vodka going back to at least the eighties. One of the ads for the current In an Absolut World series of ads has raised some eyebrows, however. This ad appeared in Quién, a Mexican magazine. 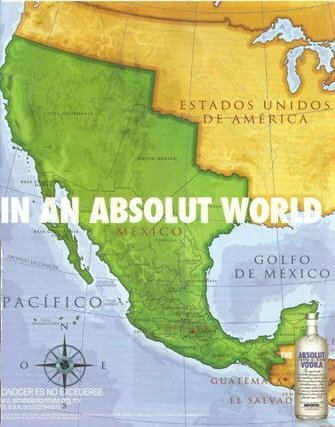 I’m curious whether this ad is the result on an independent campaign put together by the local Mexican Absolut division (if there is such a thing), or direct from the corporate headquarters in Sweden. I’m assuming the former because the latter seems like a remarkably poor business move. The 109 million Mexicans are a significant consumer population. No doubt about it. At the same time however, would you try to sell to them in such a way that could very well piss off the United States, with three times the population and four times the per capita wealth (based on per capita GDP)? Of course this assumes they’ll find out, and of course they have. I was going to suggest that they try and make the map a reality, but it occurs to me Mexico already is doing this, just in a different way. Unfortunately, the United States, by and large, seems content to let it happen. A tip of the hat to Kim at The Other Side.